ExpeditionDan: Zip, Zip, and Away! Dan's wife Robyn here and it's time for my first post! Dan started this blog around the same time we went zip lining in nearby Santa Cruz, which reminded me of our first time zip lining in Hawaii. I thought that would make a great post because we had so much fun. Since then, we've been zip lining several times in several different places, but nothing has been as good as our first time in Hawaii. ...including my absolute favorite photo of the day, which was taken on their tandem zip line (another reason this place was so awesome!). It can be a bit challenging to take pictures while zip lining, but it was totally worth it as you can see below. Another reason we loved Umauma is because of it's 2,040 foot zip line. Since we zip lined here, we haven't even come close to this length on one line. In fact, we probably haven't even come close to that with all the zip lines at each individual place combined. 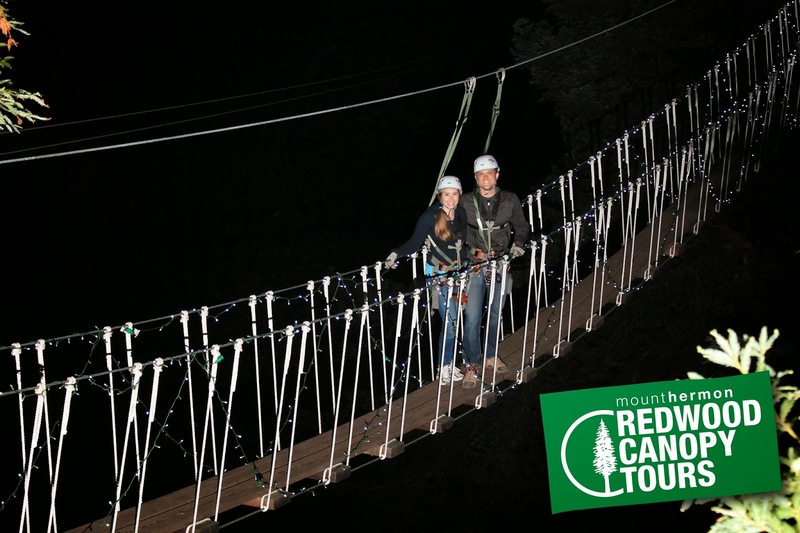 Okay, that may be a stretch, but I believe our local Redwood Canopy Tours' longest zip line is around 500 feet. Not that it's not an awesome place - I definitely recommend it if you're in the Bay Area - but it's hard to beat 2,040 feet on one line. The final reason why I, especially, liked Umauma is because they have stops set up for you. Now, if you've never zip lined before you may not know what I mean, but obviously you do need to stop before running into the tree or post that is holding the end of the line. At Umauma, they have stops set up for you, so you just go for it and don't worry about anything because it will stop you at the end. This is the only place we have zip lined that has had this. All of the other places give you gloves, so that you can stop yourself by reaching behind you and putting pressure on the line. I'm sorry, but I don't like having to do that. When I'm zip lining I want to have a good time and that includes wanting to go as fast as possible without having to worry about when to break so I don't hit whatever is at the end of the line. Having to worry about breaking at the other zip lining places really took away from the whole experience. Instead of enjoying being on the zip line during the - let's face it - short time you're actually on them, I'm worrying about when to break. Seriously, all zip line places should have these stops! If you have never zip lined before, I really recommend trying it. Even if you're afraid of heights, you might just surprise yourself and have fun. Now, I will end this post with one of my other favorite pics I took zip lining. Now go forth and zip! Oh and if you're looking for even more of a thrill, check out this list of the longest zip lines. The longest is almost 7,000 feet! I've definitely added that to my list!